and dying to get home to my bebe’s in Saint Louis. It ranges from drinking a lemonade on the steps by the ancient maison where we share an ever petite apartment while deadheading hydrangeas and waving at Sandrine across the hills, to taking a sledge-hammer to my petit congélateur and knocking the hell out of it to dislodge 7 inches of ICE. The groans and exclamations emanating from our petite abode, well, you wouldn’t have believed it if you had heard it. I could hardly believe it. I am beside myself with JOY and also with LONGING. I iron my towels, shuck some kind of spotted red and white long beans, then I walk to city center for epiliation which, I have never had done in the United States. I wait for my friend to have hers done with sounds of sheer pain while I stand in the doorway and watch people pass in the tiny street with their white pants and their interesting shoes. 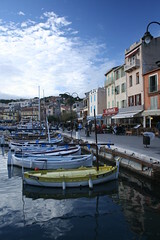 They stop to look at funny greeting cards and Cassis postcards. I drink Pastis in the late afternoon when I don’t even like it, just to blend in with the locals. I also play Boules (Petanque). I visit my doctor – only because he speaks English to me and is the ONLY doctor in 2 years to do so. Ofcourse I have ailments, but they’re not important. He speaks ENGLISH. THAT’s important. I take a coffee (That’s how we say it here – “take a cafe” – ) and watch a German film crew do the same scene over and over by the port. They are walking in couples and hop into a convertible, then they have to shoot it over again because a REAL COUPLE is walking behind them and isn’t suppose to be in the scene. It’s funny. 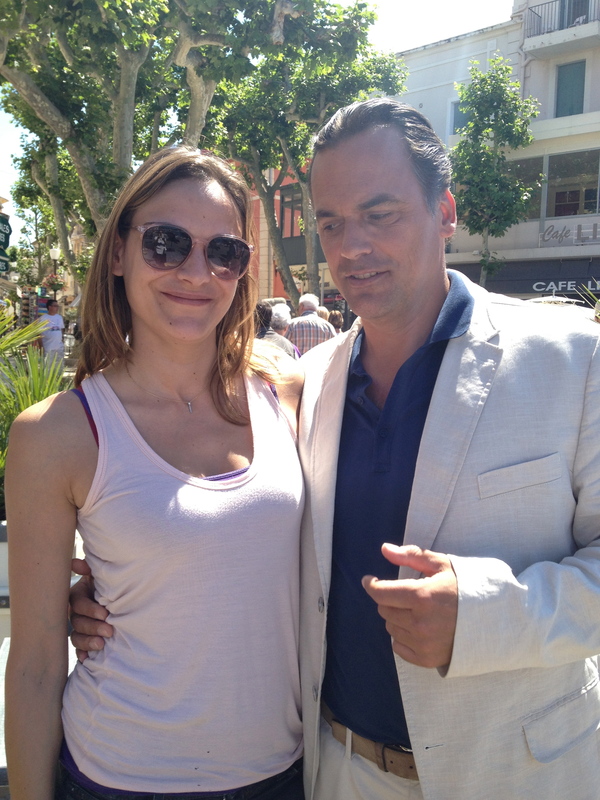 Sandrine knows some of the famous German actors, so we tell the “gofer” we want to have a picture with this famous guy, and I take his picture with Sandrine. Turns out it was the wrong actor, she wanted the young one. I liked this one. Anyway, it’s a good photo. Catch me later. I’ll have her on here with him looking down her blouse !!! Yeah, I caught him. 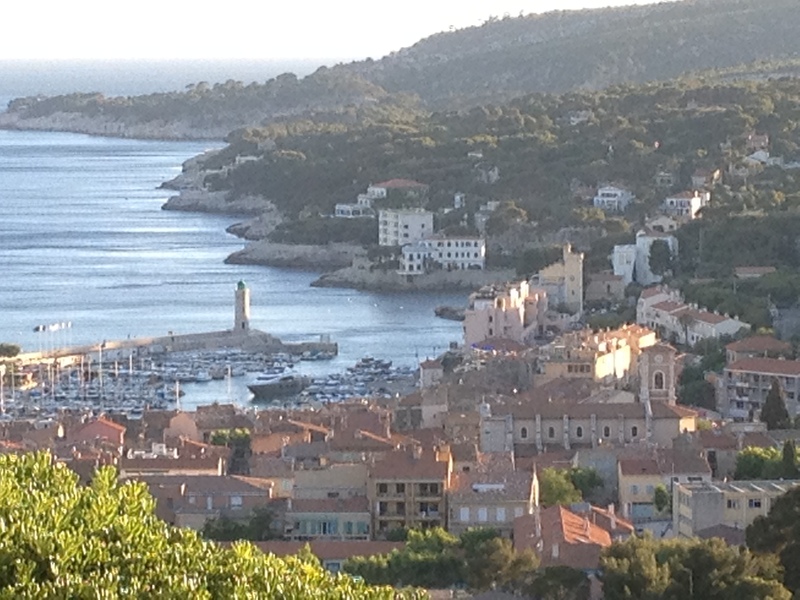 Now I am mourning the loss of my cousins who visited me and went beyond the pale in getting to Cassis, as Cassis is not an easy place to get to. 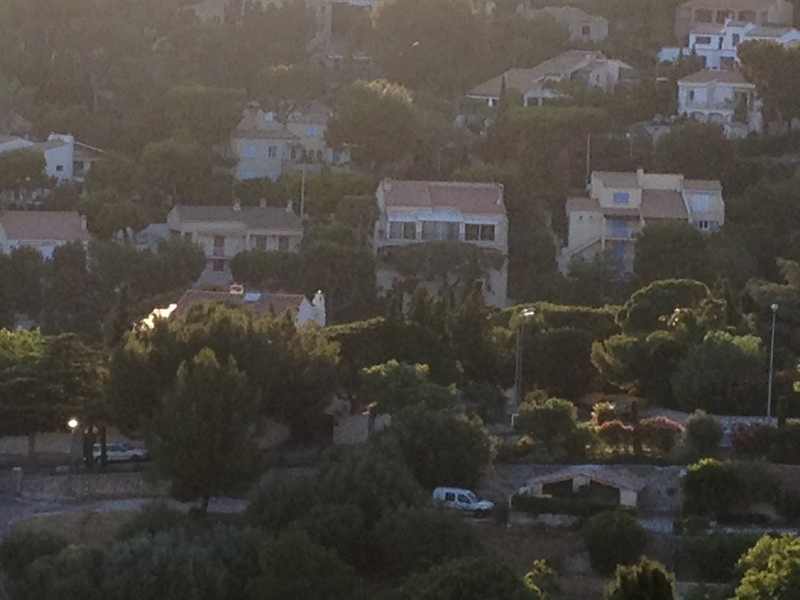 It’s a 75 euro cab ride from Marseille and it’s so breathtaking that it’s worth it. However, the cousins were brave enough to join us in our little FORD FIESTA, that tootled up the great GINESTE MOUNTAIN and got them safely to the harbour within. I miss them so much. I’m having fresh salmon tonight with ginger and white wine and shallots and wish they were here to enjoy it because they love fresh seafood. PS my wifi is tres tres slow, supremely inferior and will not allow me to upload pictures. Therefore, when it’s stronger, I will post some beautiful photos to this blog. I loved reading this and I LOVE your adventure…Life! 🙂 Aww, thanks Kiley!! Big bisous to Landon!!! Miss you!!!! Great photo of the harbor and main street and boats.